A Quitclaim Deed is simply a document that states that a person is giving up their interest in a real property. It offers little protection to the person receiving the interest, so it is most often used between family members who have already established trust. It is also commonly used by divorcing couples. You are giving up your interest in real property to a spouse or ex-spouse. You are gifting your property to another person or family member. You need to transfer property to a Living Trust or Trust. You want to show a name change that affects an existing deed. You are transferring property to a business or other entity. You've been asked by a title company to resolve a "cloud" on the title. 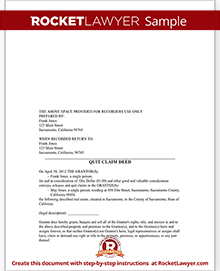 Making a Quitclaim Deed using Rocket Lawyer is simple and an easy way to transfer property from an individual to a family member, ex-spouse, business entity or Trust. Since this document offers little protection for the grantee, it is not recommended to be used between those who do not know each other well. A Quitclaim Deed "quits" an interest (claim) on a real property. It is often used to transfer property between family members or to transfer real property to a Trust or business entity. The person giving up interest (grantor) may not even have their name on the title, but they may be transferring their acquired or assumed interest such as signing a Quitclaim Deed to show that they have no interest in their spouse's property. It is most often used for transfers of property that does not involve a sale or purchase of the property. 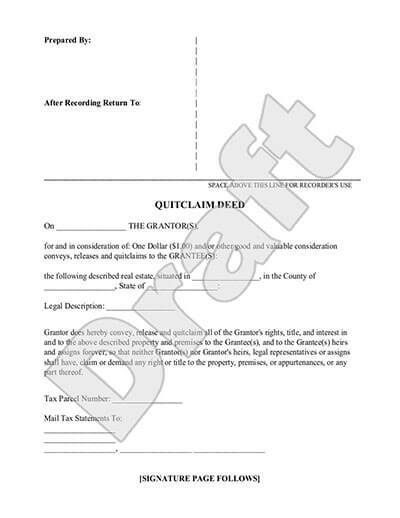 What information is needed to make a Quitclaim Deed? Will the grantor possess all or part of the property, such as live in the house? No guarantees. The grantor may not actually have title to the property. There may be liens or other interests in the property as well. A Quitclaim Deed does not include a guarantee or warranty. No guarantee of title. In a typical real estate purchase transaction, title insurance is often required by mortgage lenders. In this situation, you'll most likely want to use a General Warranty Deed. It cannot change a mortgage. For example, if a spouse signed a Quitclaim Deed to release their interest to a property that the couple purchased together, both names will still be on the mortgage and both will still be liable for the debt. It cannot supersede a Will. A person could sign a Quitclaim Deed to show they do not have interest in a property. However, if later the property is distributed to them from the directions of a Will they do not have to give up the property. A Quitclaim Deed provides zero protection. There may be a statute of limitations. It varies by state, but some states will only honor the Quitclaim Deed for a certain amount of time. You need to check with your county recorder's office to see if a statute of limitations applies. Community property laws may supersede a Quitclaim Deed. In some states, a court may decide that the person giving up their interest in the property may be under duress or the transfer might be deemed unfair and the document may not be enforced. After you have completed making your Quitclaim Deed and have it signed and notarized, in most cases, you will file the document with your local county clerk or office of the assessor or recorder. Some states may also require witness signatures and/or grantee signatures as well. Transferring property using Quitclaim Deeds may have tax implications. If a person receives property using this type of Deed, they may be subject to paying a gift tax. If there are tax liens on the property this document will not get rid of them. The tax lien would still be attached to the property. Of course, if the property is sold there could be tax responsibilities associated with the sale. Generally, Quitclaim Deeds are not taxable when the property is transferred between spouses. In addition, usually, there are no tax responsibilities if the property (with clean title) is transferred to a charity. When property is put into a Trust, the IRS calculates gift value that may be taxable. Quitclaim Deeds to not provide a guarantee or warranty that the grantor has legal title and right to transfer or sell the property. It does not offer protection to the grantee and that's why it is most often used when the two parties know each other well. These documents can be used to transfer an interest in property between spouses. In states with community property laws transferring of property between spouses may be considered a disadvantaged transaction to the person giving up their interest in the property. For example, if one spouse purchases a home in their name alone, perhaps because the other spouse didn't have proper credit, and then later the couple plans to divorce, both spouses could have a legal interest in the property because of their state's community property laws. Even though both documents can be used to transfer an interest in a property, a court may decide ultimately whether the transfer appeared to be fair or not. You may have heard the phrase "quick claim deed." However, this is simply a mispronunciation of Quitclaim Deed. It is not the name of an actual document. Our step-by-step interview process makes creating a printable Quitclaim Deed easy.